A Pain in the Neck – WHAT IS CERVICAL SPONDYLOSIS ? 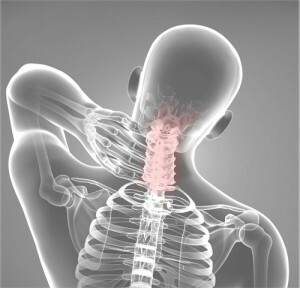 Neck pain can be caused by many reasons; one of them is related to getting older. Like the rest of the body, the discs and the joints in the neck region (cervical spine) slowly degenerate as we grow old. Cervical spondylosis, commonly called the arthritis of the neck, is the medical term for these age related wear and tear changes that happen over time. It occurs early in persons pursuing white collar jobs or those susceptible to neck strains because of keeping the neck constantly in one position while reading, writing etc. The pathology begins in the disc or the cartilage between the spinal bones. Degeneration of disc results in reduction of disc space and overgrowth of extra bone. These bony growths irritate the nerve roots and give rise to pain in the upper limbs. Age is the most common risk factor for cervical spondylosis. It occurs mainly in patients who are middle aged or older. Genetic predisposition-family history of neck pain is found in many cases. Occupation where there is lot of neck movement and overhead work or lifting of heavy weights. Previous history of injury or neck strains. The symptoms often develop slowly and are gradually progressing. But they may get worse suddenly. You may feel the pain and discomfort over the shoulder blade or it may radiate to the upper arm, forearm and fingers. Cervical spondylosis may begin with an episode of giddiness occasionally. Dr. Rajesh Shah has been working on these chronic cases including cervical spondylosis since more than 30 years now. His research based molecules have benefitted patients in over 127 countries. They have offered fantastic pain relief as well as better mobility in cases of cervical spondylosis. The length of treatment for cervical spondylosis would depend on the extent of inflammation and compression. Most patients need medication for about six to eight months. Physiotherapy along with homoeopathy works wonders in such cases.